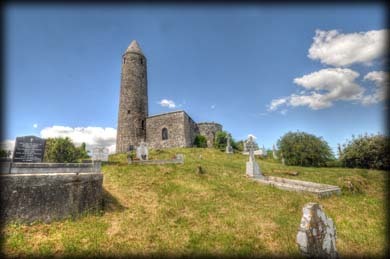 The round tower at Turlough is situated in a hillside graveyard, similar to the tower at Meelick which I had just visited an hour before. Although this tower has it's cap and more windows than Meelick it does not have the same impact as it's neighbour. Standing to a height of just under 23 metres the tower is smaller than average and is abutted by a rather plain cruciform shaped 18th century church. The original arched doorway is approximately 4 metres above the present ground level. 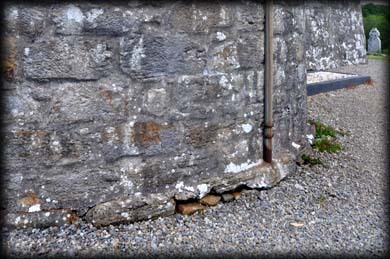 This doorway is now blocked up, as is a more modern doorway that was added to the tower at a later date. The conical cap was substantially repaired in the 19th century. There are four large angle-headed windows at bell floor level, each facing to the left of the four cardinal points. The four smaller windows in the drum are all lintelled. There is a visible offset on the south side of the tower. Very little is known about the history of this monastic site, but traditionally it is believed St Patrick founded the first church here. We do know that in 1351 the Archbishop of Armagh, who claimed jurisdiction over it, was ordered by the then Pope to relinquish his rights to the Archbishop of Tuam. There are a few features of the present church worth looking out for, these may have come from a previous church built on the site. 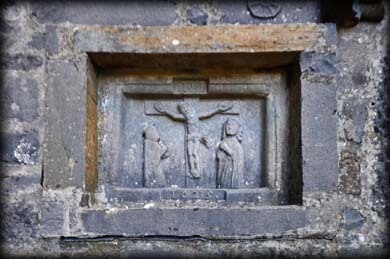 These include a 16th century mullioned window and two crucifixion plaques, one of which is dated 1625. 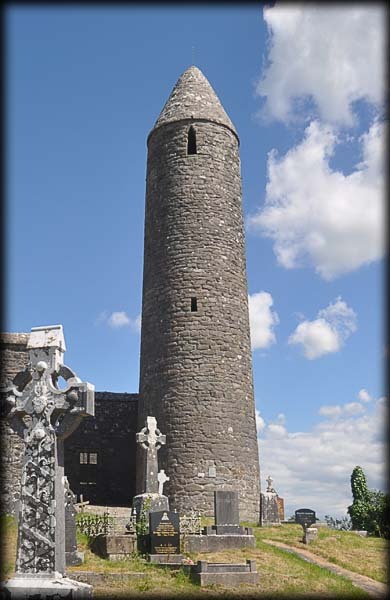 This is one of the five round towers located in County Mayo. pictured above is one of the angled bell-floor windows and to the right, the original arched doorway. Situated: From Castlebar head NE on the N5 for 5 kilometres. At the crossroads turn left. Then 900 metres turn right and then immediate left. After 550 metres turn left. The tower is 250 metres down here on your right. Discovery Map 32: M 2056 9392. Last visit June 2014. Dimensions: Height 22.85m. Diameter 5.5m. Door: 3.96m above ground. Type: Arched. Windows: Eight. 4 lintelled and 4 large angled. Cap: A repaired conical cap.